First comes setting up the boat, putting up the jib and the main sail. Then maneuvering out of the mooring field. And we’re off! Before we left land, we mapped out where we wanted to go. Over towards St. John mooring at Caneel Bay to set up the canopy. Then back through current cut, to Christmas Cove. In time to order a pizza at Pizza Pie of course. After a slice and successful anchor stop we were back to moor at St. Thomas Yacht Club to complete my certification. The verdict was. I passed! Waiting for me when I got back to land was Kierie Culver with my Dear Graduate letter in hand. “It’s so fun to get people on the Island that are interested in sailing get them out and be able to take a boat out on their own,” Kyree Culver, Office Manager at St. Thomas Sailing School said. I could not have done it without the amazing team at St. Thomas Sailing Center and my instructor Bruno Patchuli.“What we learned are the parts of the boat, parts of the sail but also importantly the points of sail and the direction we need to go using the wind that will take us from point A to point B. We also learned how to leave a mooring how to get back to a mooring and also at the very end we even get into some navigation,” Patchuli added. 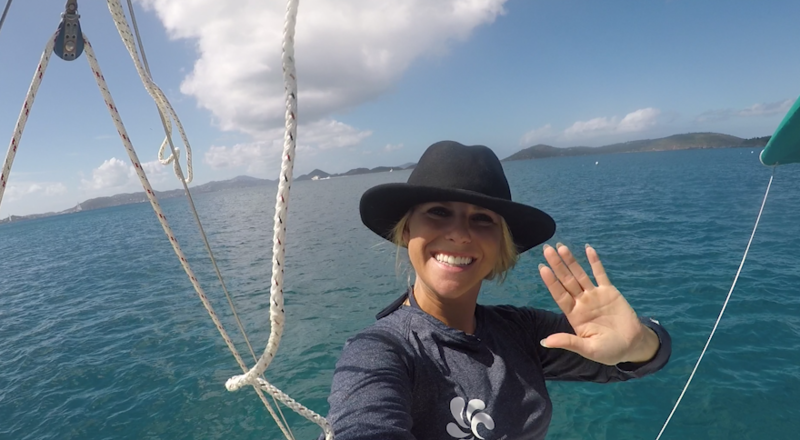 The entire crew at the St. Thomas Yacht Club has made my dream of sailing come true. Now all that’s left is all of this at my fingertips. For more information on the St. Thomas Sailing Center go to https://stsc.styc.club.